A favorite shrubby perennial for water-wise gardens, purple rock rose is a delight when it comes into bloom during summer months. Plants grow into a dense mound and sport long, wavy grey-green foliage. It’s the perfect transition plant in mixed perennial and shrub beds. Come summer, masses of purple to orchid colored blooms with burgundy spots emerge. Flower petals have a papery preserved look to them. The 3-inch diameter blooms are attractive to bees and other pollinators. Plants are also incredibly tough; plant them in poor soils, areas with no irrigation, rock gardens and even seaside. Purple rock rose is able to withstand salt spray, wind and sandy soils just as well as it can tolerate heavier clay soils and intense heat. Plants are very drought tolerant once established. 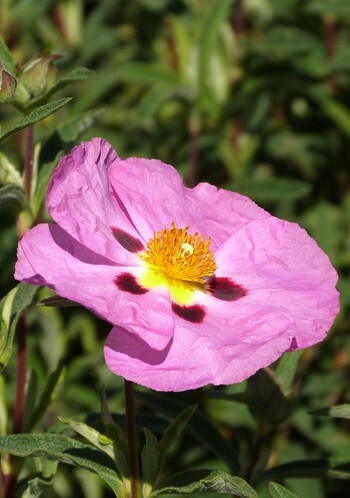 All that purple rock rose asks of you is to plant it in a sunny location with good drainage. Good companion plants include agave, yucca, ornamental grasses and other sun-loving water-wise plants. Purple rock rose is cold-hardy down to about 15 F.